Get Dog Smart With Diggity The Dog! Despite the fact that more than half of the seriously injured dog bite victims are children and that statistics report that more than half of all children will be bitten by age 12, schools do not teach dog safety. The experts agree that the solution is education. Author Lisa LeLeu made it her mission to educate children and parents after her son survived a horrifying dog attack leaving him with over 300 stitches in his face causing facial paralysis and permanent scarring. Lisa believes that this incident was totally preventable through education. Diggity the Dog’s story encompasses the number one cure for the dog bite epidemic. The story takes children on a fun walk through the neighborhood. Along the way, children encounter a whole lot of dogs in different situations. Diggity tells the “do’s” and “don’ts” – right from the doggie’s mouth. It is up to parents to teach their children what they can do and must not do around dogs. Children need to know how to read the danger signs from a dog and what situations must always be avoided, like going into a neighbor’s backyard where there is a dog. Here’s how to make the lessons fun! 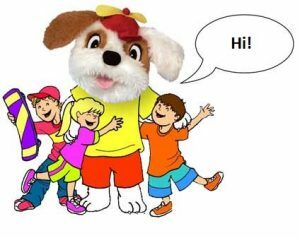 Teach Dog Safety with Diggity the Dog’s Puppet Show Book, one of Lisa LeLeu’s award winning books — a book that you read while using the attached puppet to make the story come alive. The puppet is actually part of the story, and part of every drawing in the book. The book comes with a free “Get Dog Smart” coloring book and makes a great reward for a child who has learned the rules on dog safety.